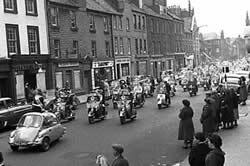 The origins of the first scooter rallies in Dunbar go back to early 1958, when Edinburgh Lambretta Club member Doug Sim was looking for a venue for a rally after Meadowbank Stadium in Edinburgh. 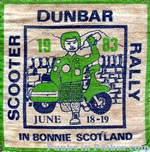 Doug's fiance , Pat , had an uncle that was on Dunbar Council - David Deans as best we know at the moment - and after a presentation from the scooter club to a council meeting, Dunbar gave permission to hold the rally in town , and even put up a trophy as part of their full support. 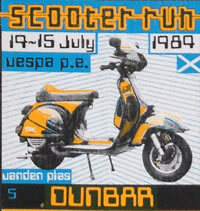 David Deans also ran the amusement arcade bt the east beach - and part of that was a shooting gallery...rumours are that Mr Deans offered a Lambretta scooter to the best scorer throughout the year...making sure some of the scooterists made regular visits to Dunbar. There's a good business man for you :) . 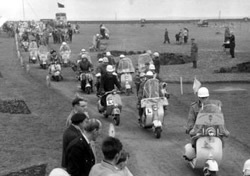 The rally took place over 24th & 25th May 1958 and was extremely well attended , with over 1000 scooters from around the UK attending. A dance was organised for the Saturday night and a Scooter Rally Queen crowned, who led the parade around town on the Sunday. 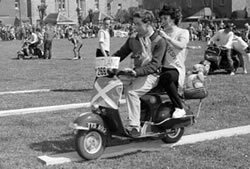 The following year's rally was equally well attended , and backed by the Council, with further events such as cabaret and pram chariots race. 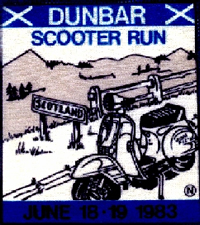 The revival of mods and furthermore - scooterists - in the early 80's seen an approach to Dunbar to re-kindle past fun from the town , but with poor support from local organisations & venues , the 1980's rallies were always a poor affair , with little to do and poor entertainment for the travelling scooterists. 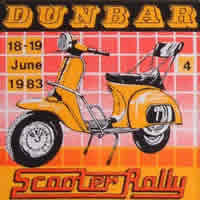 Nowadays you often find local scooter clubs help or even fully organise rallies in their area - sorting out music , bands , custom shows & trophies etc, but in the 80's Dunbar didn't have any scooter club , in fact Dunbar had one sole scooterists... yours truly ! The main Scottish Rally these days is held in Kelso - and is very well organised and supported by local police and council. As well as other club organised events in Stirling, Fife & Aberdeen/Inverness. 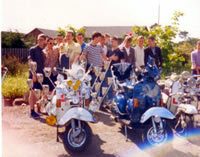 There are a large number of events in England and Wales, and the current bunch of scooterists attending include original 60's mods , 80's revivalists and scooterists and "newbies" or "born-agains" , the folk who have had the kids , done the family thing and miss the laughs and thrill of whizzing about the country on 10" wheels. Many of the people on the scene these days have never stopped attending rallies since they started whether it be in the 50's 60's 70's or 80's. Many thanks to Scootering Magazine for a lot of the information provided here. show in 1988 - where it might be repeated this summer.
" 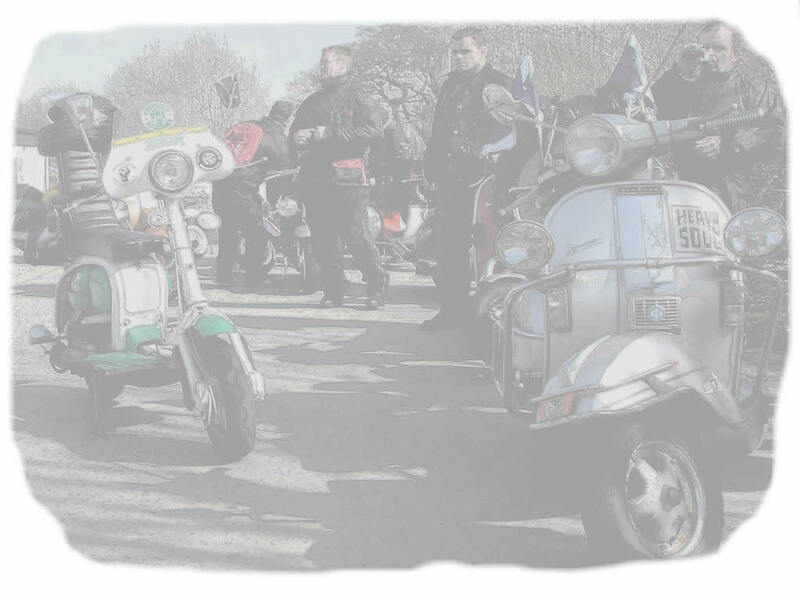 When did you first discover Northern Soul and what do you love so much about it? 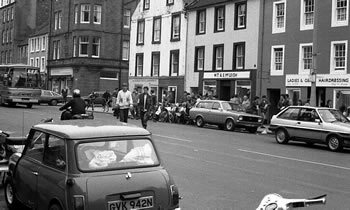 In 1983 I went on the back of a vespa to a scooter rally in Dunbar and it was there I was first introduced to the term Northern soul. I loved the sound of the words and I loved the imagery; the fist clenched in the black panther salute - 'keep the faith'. The first record I heard was 'Move On Up' by Curtis Mayfield and it knocked me out. It still knocks me out. 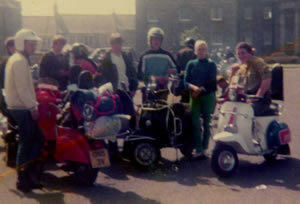 I stayed on at school to do Highers and gradually lost touch with mates who were into the mod/scooter thing. I bought a guitar and got into guitar music. 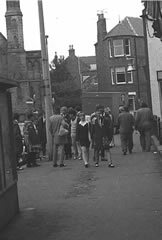 About 10 years later the 'good foot' club started in Glasgow, by this point I had some money in my pocket and I decided then to start digging. I love the blend of the beat and the offbeat, the killer melodies, the vibraphone and the bassline, the distorted tambourine, the piano as percussion, the movement of the chords, the major seventh, the dead-on lyrics, the harmonies, the call and response, the phrasing, the lead vocal, the sound. I also like the fact that it's a working class thing."